What would be an appropriate development for a full-block site between Central Park West and Broadway and 61st and 62nd Streets? The context is the glossy Trump International Hotel and Apartments tower at 1 Central Park West, the huge, reflective-glass Time-Warner Center on the west side of Columbus Circle, one of Central Park West's legendary twin-towered apartment buildings, and the proximity of the Lincoln Center for the Performing Arts. The timing is the start of one of the city's most historic real estate booms with rapidly escalating prices and a neighborhood recently rejuvenated by the completion of the Time Warner Center with Whole Foods in its basement and the Mandarin Hotel in the north tower along with the headquarters of Time-Warner and a couple hundred very expensive condominium apartments. In 2004, an investment group headed by Arthur and William Lie Zeckendorf, the Whitehall Fund of Goldman Sachs and a company controlled by Eyal Offer acquired this full-block site. The western half of the block had been occupied for many years by a vacant lot , one of the last major "mystery" sites in Manhattan, and the eastern half, facing Central Park, was occupied by the Mayflower Hotel. The Goulandris family, Greek shippers, represented by John Avlon, had begun assembling the site in 1973 and within five years it had owned the entire block and by 1982 it had stripped the Mayflower hotel of much of its facade's terracotta decoration. The last building on the Broadway side of the block was demolished in 1987. How could such a desirable site not be developed for so many years? Perhaps the answer is timing, perhaps, it's just quixotic. In any event, the Zeckendorfs and their partners began to put an end to the mystery with their purchase of the entire block for $401 million. According to a May 27, 2004 article by Charles Bagli in The New York Times, "models built for the owners by the architects Cesar Pelli & Associates showed two towers of about 34 stories sitting on a five-story base." 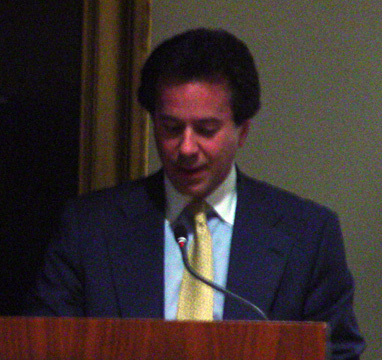 Mr. Pelli is the architect of the Petronas Towers in Kuala Lumpur, One Beacon Court on Lexington Avenue and 59th Street and the World Financial Center at Battery Park City. 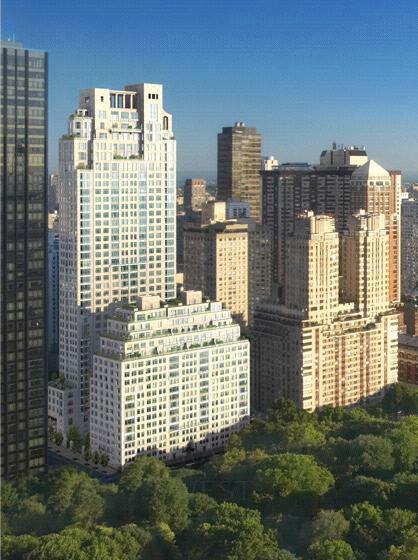 According to Mr. Bagli's article, other prospective bidders on the property had been Stephen M. Ross of the Related companies, a developer of the Time-Warner Center, Steve Roth of Vornado Realty Trust, a developer of One Beacon Court, and Edward M. Minskoff. 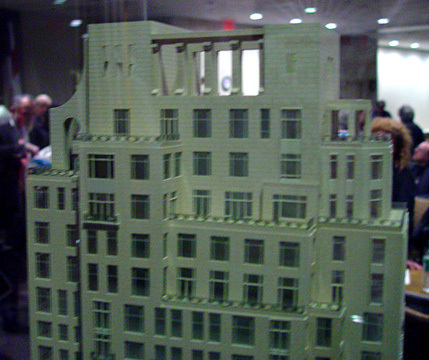 A November 4, 2004 article in The New York Times by David W. Dunlap noted that "Long past its glory days - if it ever really had any - the Mayflower Hotel on the Park is disappearing from the New York scene as quietly as it occupied it," adding that the 335-room hotel was a "background" building. "Originally two side-by-side residential hotels called the Mayflower-Plymouth, which opened in 1926, the building was designed by Emery Roth," Mr. Dunlap wrote. Mr. Roth would later design Central Park West's great skyline buildings, the twin-towered San Remo at 74th Street and the triple-towered Beresford at 81st Street. In his article about the auction of furnishings from the hotel, Mr. Dunlap wrote that "about the only thing not being offered for sale was the plaque that used to be affixed to the façade commemorating the site as the birthplace in 1898 of Vincent Youmans, the composer of 'No, No, Nanette,' which featured 'Tea for Two.'" "That plaque," Mr. Dunlap continued, "served as an apt metaphor for the reticent Mayflower itself, attesting to the fact that the most notable event in the history of the site occurred before the hotel was built. Yet the Mayflower had its share of modern distinctions. It was the home of Patrick Sullivan, a creator of the cartoon Felix the Cat, and of Max Schaffer, the operator of Hubert's Museum on West 42nd Street, which included a fabled flea circus. It was where the Bolshoi Ballet troupe was staying in August 1979 when one of its leading dancers, Alexander Godunov, defected to the United States." 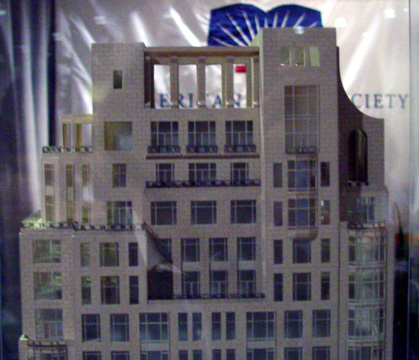 A March 22, 2005 article in The New York Post by Steve Cuozzo reported that the redevelopment of the block was being designed by Cesar Pelli and Associates, adding that "sources said architects Schuman Lichtenstein Claman & Efron have been tapped to design the interior, a claim that could not be confirmed." 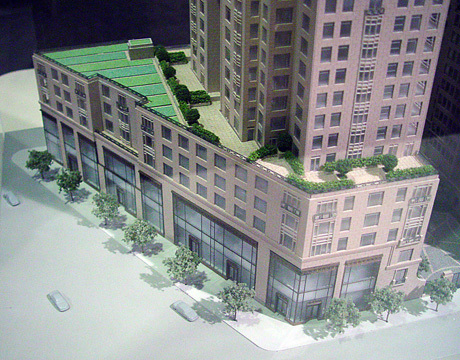 "No zoning changes are required for the project," the article continued, adding that the Special Lincoln Square District permits zoning bonuses in exchange for construction of off-site moderate-income housing at 210 West 102nd Street. 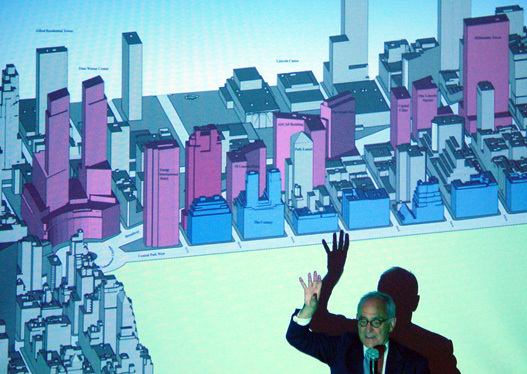 The district's zoning mandates that a new project on the site must have a 85-foot-high wall on the Broadway building line before any setbacks and Mr. Cuozzo's article maintained that "two towers of different heights will rise above a much lower base - one tower near to Broadway, the other closer to Central Park West." The notion of twin towers for the site seemed obvious, given Central Park West's great architectural heritage of such structures. However, if the new owners planned to abide by, and take advantage of, the provisions of the special Lincoln Square Zoning District, such a design may not have been practical. 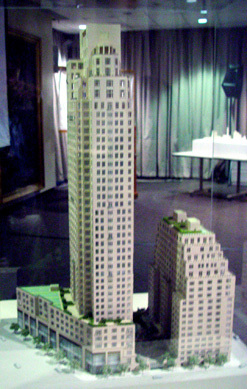 Given that the real estate market places very high premium on Central Park vistas and high floors and that twin towers are not the most efficient use of space and given that developers often enjoy one-upping their competitors it was not inconceivable that the new project would have a single tower on Central Park West that would be taller than the Trump International Hotel and Tower just to the south. In any event, given the high acquisition costs of the land it was certain that the new project would be targeted at the residential high end. As it worked out, the Zeckendorfs opted not for Mr. Pelli but for Robert A. M. Stern and a two-, rather than twin-, towered scheme. The tower slabs would be parallel to Central Park West and separated by a 60-foot-wide courtyard with the taller tower in the middle of the block and a low-rise wing along Broadway. 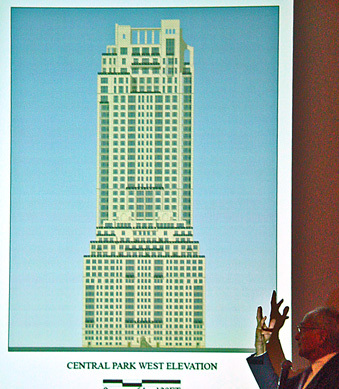 Mr. Stern, who has designed high-rise apartment towers in the city such as the Chatham at 181 East 65th Street, TriBeCa Park at 400 Chambers Street in Battery Park City and the Westminster at 180 West 20th Street, is known as a post-modernist architect as well as one of the country's foremost architectural historians. His design here almost reproduces the massing of the former Mayflower Hotel for the lower of the two buildings but instead of brown brick has clad it, and the higher tower, entirely in limestone and glass. The design is rather startling and is certainly Mr. Stern's greatest Post-Modern achievement as this is the best new pre-war building in town. It abounds in fine details and subtle touches and the top of the tall tower is a very fine skyline addition. The decision to go with Mr. Stern was obviously a conservative one, but a very safe bet. What is rather extraordinary about the design is how deferential it is not only to Trump's tower to the south but also to the apartment tower to the north on Broadway. It preserves many important views from both those towers and the placement of the tall tower actually gives it impressive views down Broadway. 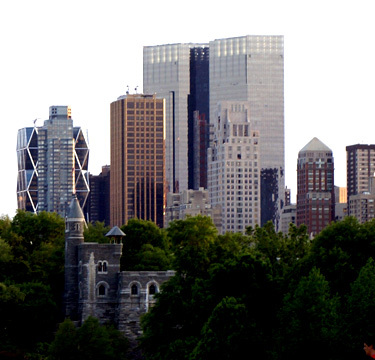 Its stately design avoids clashing with the reflective towers to the south and significantly reinforces the "solidity" of the streetwall of Central Park West. Such sites do not come up often and the city still was in the backwaters of tepid design, a lingering malaise that would only begin to alter around the time of this building's completion. It was a safe bet, and it paid off well as apartments in the building quickly sold at astronomical prices. The lower tower rises 231 feet on Central Park West while the mid-block tower is about the same height as the Trump International Hotel and Tower across the street to the south and about 200 feet taller than the Century Apartments across the street to the north. The taller of the two buildings has an asymmetrical top. One tower is 20 stories and the other is 43 stories. 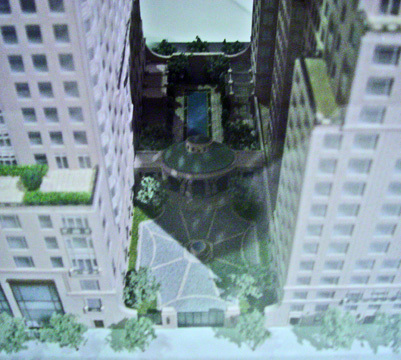 The Central Park West building has several terraces and its roof is landscaped to enhance the vistas of neighbors on higher floors. The development has 201 apartments plus 30 "suites" that "may be purchased by residents for their guests or personal staff, or for use as home offices." The two towers are connected at their base. 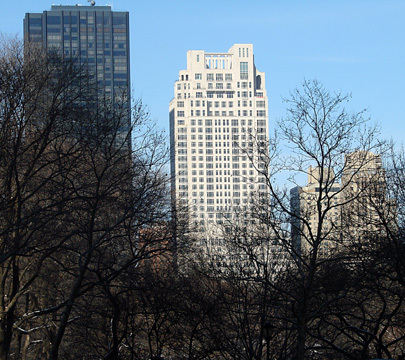 The Central Park West wing is known as "The House" and the higher mid-block structure is known as "The Tower." "In the tradition of the city's most prestigious apartment houses, Fifteen Central Park West has two distinct lobbies. The magnificent Central Park West lobby will be a sweeping 35 feet by 45 feet, with two fireplaces, some of the world's most handsome stone, and custom hardwood paneling. The other lobby will be off of the cobblestone motor court, featuring a grand copper-clad and glass entrance pavilion." Apartments, it continued, "will range from full-floor penthouses (6,617 square feet), to terraced duplex penthouses (6,139 square feet), to oversized one-bedroom apartments (1,026 square feet)." According to a fact sheet for the project, "Ninety percent of the units have direct park views," ceiling heights will be 10 to 14 feet, and the building will have more than 40 full-time staff members. The apartments will have wood-burning fireplaces, and residents will have a private dining room which can accommodate up to 60 guests with room service and a private chef, a private screening room designed by Theo Kalomirakis, a business center, a game room with a billiard table, full-time maid and maintenance services, individual wine cellars, bicycle storage rooms, private storage units and a 13,500-square-foot fitness center with a 75-foot swimming pool with skylights illuminated by the reflecting pool in the garden above. Prior to the demolished Mayflower Hotel, the site was occupied by the United States Motor Company and Dorland's Riding Academy. 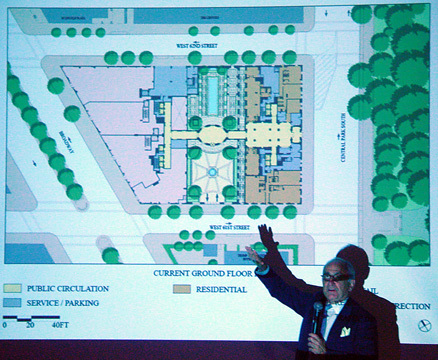 The tower and the Central Park West building are separated by a 60-foot-wide street-level, walled open space. On 61st Street, that space has a turnaround driveway, or "motor court," with motorized sliding gates. On 62nd Street, the space is walled but has grills that enable pedestrians to see into it. This northern space is landscaped with a reflecting pool that serves as a skylight for a swimming pool underneath in the project's fitness center. In the middle of the through-block space there is an oval entrance pavilion and the through-block space also has a through-block pedestrian arcade. The five-story base along Broadway has two-story-high retail spaces topped by three residential floors. The Central Park West entrance is two-stories tall with an arched and curved surround flanked by wall lanterns. The asymmetrical top of the tower building has a variety of elements including an arch reminiscent of one atop 1040 Fifth Avenue, open colonnades and a pergola-like structure. The project received a 20 percent zoning bonus under the city's "inclusionary housing" program and this requirement is being met by providing 41 such units at 33 West End Avenue under the auspices of the Metropolitan Council on Jewish Poverty. There are two elevator stacks in each building so that the elevators will open onto two-apartment hallways. Apartment prices ranged initially from about $2 million to about $45 million. SLCE is the architect of record. 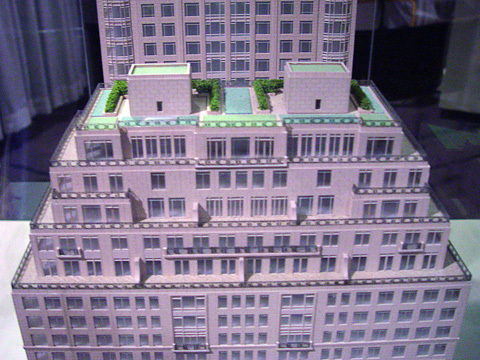 In the November 9, 2010 edition of The New York Post, Jennifer Gould Keil wrote that "The most expensive condo in the city is a Central Park West penthouse that a mystery buyer plans to purchase for $40 million, The Post has learned," adding that "It's the highest-priced residential real estate in the Big Apple at a record $10,259 a square foot."